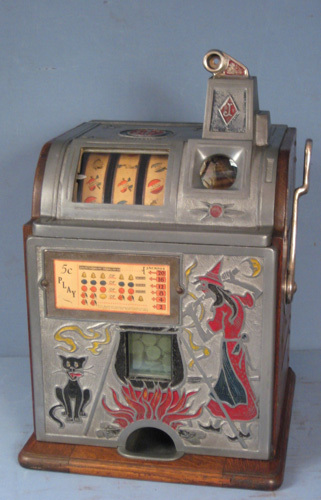 I am restoring a Rowe cigarette machine from the 50's. I can't get the product pull levers to work. I need guidance on how to make the levers work. Is this same model you posted several months ago...? Appears to be a Rowe Commander Cigarette Vendor. Vintage-Restorations wrote: Is this same model you posted several months ago...? Appears to be a Rowe Commander Cigarette Vendor. I did post a while back. How do I trip the lever so the pulls work? First, tape down a few of the sold out levers at the bottom of each column. If any part of the coin detectors move outward attempting to detect coins, the cycle will be halted because the mechanism detects no coins. You have to manually hold these levers, #3, as you pull the selection knob/pull. If I hold parts labelled 3 and move part 2 forward, the mechanism seems to work. However, I still can't pull the product release knob, Could something else be holding it back? The only other issue would be the sold out lever for the column you are attempting to pull... Make sure you tape down this lever simulating there is a pack of cigarettes in the column. See photo-I tried keeping the little tabs down. I have blocks of wood sitting in the slot. I can move part 2 forward but the pull knobs still don't come forward. I have the kechanism out of the carcass. Could this cause a problem? So, to reiterate, you placed wood blocks into a vend column which dis-engages the sold out lock lever, you hold the "coin" fingers/feelers, #3 in my photo, and keep them from traveling to the right while pulling the knob for the product column with the wood block... If this is all correct, the only thing I can think of at this time is to ensure every pull knob is securely and correctly positioned all the way back in the ready to vend position. My Coin return pull hangs out a bit. Could that be a problem? See photo. From the bottom, I can pull the long round rod that interfaces with the saw tooth. See photo. The pulls still do not work.